We found that shipments during the fourth quarter of 2011 behaved according to past years with regard to seasonality, the new seasonality that has developed since the economic crash of 2008. Prior to that shift, Q4 was a seasonally up quarter, since 2008 it’s been a seasonally low to down quarter—and this year it was down the most since 2008 (see figure 1). A lot of it was blamed on the floods in Thailand, but general economic malaise still permeates the industry. Our forecast for the coming years has been modified since the last report, and is less aggressive on both desktops and notebooks—tablets have changed the nature of the PC market. Our findings include Desktops, Notebooks (and Netbooks), and PC-based commercial (i.e., POS) and industrial/scientific and embedded; and do not include handhelds (i.e., mobile phones), x86 Servers or ARM-based Tablets (i.e. iPad and Android-based Tablets), Smartbooks, or ARM-based Servers. This quarter, Intel celebrated its eighth quarter of shipping its Embedded Processor Graphics CPU—EPG, a multi-function design that combines a graphics processor and CPU in the same package. Intel’s desktop EPG shipments had a very strong double digit growth in while Notebooks dropped double digits. Combined with a decrease in overall IGP chipsets, Intel came in for the quarter with a -12.3% drop from Q3. AMD had huge 44.8% desktop double digit growth in its HPU shipments, and even good growth in their desktop IGPs. However, like Intel, its overall quarter results were down due to declining notebook sales. AMD’s overall quarter to quarter results showed a -3.4% drop. Year to year this quarter Intel gained about 7% market share, AMD gained 2.6%, and Nvidia slipped -7% in the overall market partially due to the company withdrawing from the integrated segments. 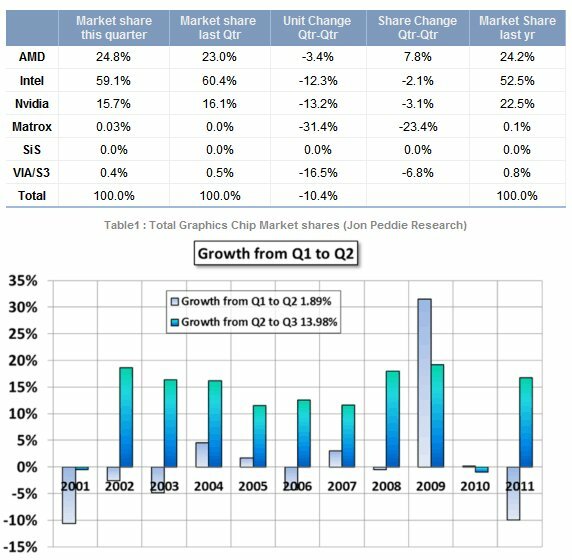 The quarter’s change in total graphics chip shipments from last quarter decreased 10.4%, above the ten-year average of 0.83%. A little over 124 graphics chips shipped, down from 138.5 million units last quarter, and up from 114 million units this quarter a year ago. Discrete GPUs declined almost 12% from the last quarter and were down almost 3.5% from last year for the same quarter. Almost 93.5 million PCs shipped worldwide this quarter, an increase of 1.8% compared to last quarter (based on an average of reports from Dataquest, IDC, and HSI). Graphics chips (GPUs) and chips with graphics (IGPs, HPUs, and EPGs) are a leading indicator for the PC market. At least one and often two GPUs are present in every PC shipped. It can take the form of a discrete chip, a GPU integrated in the chipset or embedded in the CPU. The average has grown from 115% in 2001 to almost 150% GPUs per PC. Since the crash of 2008, combined with the introduction and influence of ARM-based tablets, the PC market has deviated from historical trends. Until the segment for tablets is clearly defined the fluctuations in the market data is likely to continue. The disruptions probably won’t settle down for a while as tablets find their place in the market and agreement can be reached on whether to include them in the PC market analysis, or to not. AMD’s overall graphics market share increased 1,8% from last quarter due mostly to HPU shipments. Year to year for the quarter the market increased. Shipments increased to 124 million units, up 10.6 million units from this quarter last year.